Learn the Brostrom lateral ligament reconstruction using JuggerKnot soft anchor(Zimmer-Biomet). surgical technique with step by step instructions on OrthOracle. Our e-learning platform contains high resolution images and a certified CME of the Brostrom lateral ligament reconstruction using JuggerKnot soft anchor(Zimmer-Biomet). surgical procedure. It is estimated that, in the UK, there are approximately 7000 ankle sprains per day. 85% of these sprains will involve the anterior talo-fibular (ATFL) and calcaneo-fibular (CFL) ligaments which are the principal lateral ligament restraints. Most will resolve with little input other than basic remedies such as rest, ice, compression and elevation. In those cases that do not recover quickly, it is either because they have been subjected to repeated sprains or there is a concomitant pathology such as an osteochondral lesions of the talus, peroneal tendon tears or peroneal retinaculum injury. 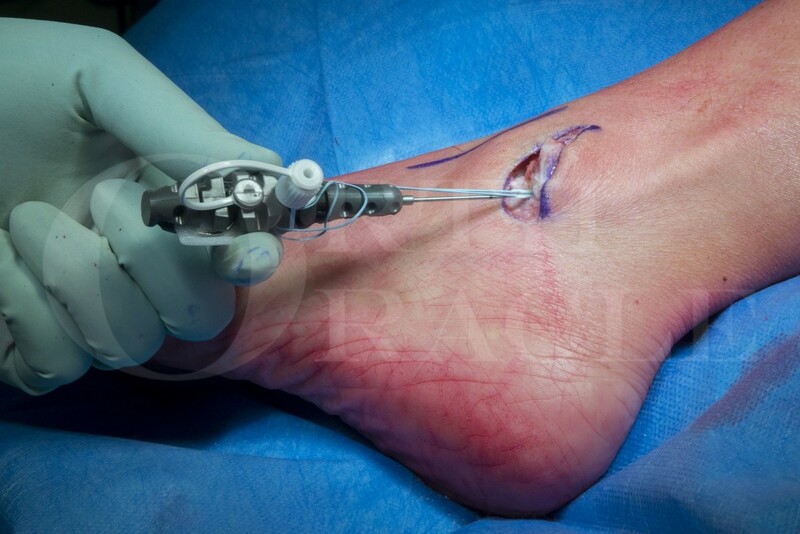 In those cases where non-operative treatment fails, surgical intervention may be necessary with the aim of restoring ankle stability by repair of the lateral ligament complex which can be done using the Zimmer Biomet JuggerKnot soft (suture) anchor. One surgical technique that has continued good results was first described by Brostrom in 1966, whereby the ATFL and CFL are imbricated, with an additional modification by Gould in 1980 which detailed additional imbrication of the inferior extensor retinaculum (IER). This technique forms the mainstay of anatomic ankle reconstruction techniques not only because of the high success rates but also because of low rates of complication such as ankle stiffness and subtalar arthritis. The advantage of the Zimmer Biomet JuggerKnot soft anchor system is that it offers excellent pull-out strength at the bone-anchor interface with a minimal footprint in the bone. Institution: The Northern General Hospital, Sheffield.